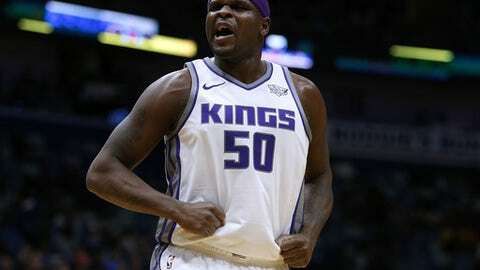 NEW ORLEANS (AP) Zach Randolph and the Sacramento Kings are going home happy after closing out a six-game road trip by winning three of their last four. Randolph scored 26 points and grabbed 12 rebounds, and the Kings beat the New Orleans Pelicans 114-103 on Tuesday night. Kosta Koufos had 17 points and a career-high 17 rebounds for the Kings, who were able to exploit Cousins’ absence by getting double-doubles from both of their starting big men. Koufous accounted for half of Sacramento’s 14 offensive rebounds, which the Kings converted into a 26-0 advantage in second-chance points. The Pelicans continue to struggle, having gone winless since losing All-Star center DeMarcus Cousins to a season-ending injury. Anthony Davis had 23 points and 13 rebounds for the Pelicans, while Jrue Holiday scored 21 points and Ian Clark a season-high 20, hitting nine of 10 shots. But New Orleans has lost both of its games without Cousins, who went out for the season with a ruptured left Achilles at the end of a victory over Houston last Friday night. The Pelicans won seven of the last eight games Cousins played. They’ve lost two straight – at home to teams that came in at .500 or worse – without him. ”Any time you lose a piece like DeMarcus, there’s going to be residue from it,” Pelicans coach Alvin Gentry said. ”Some kind of way, we’ve got to get over that. It may take a few games. Rookie De’Aaron Fox and reserve guard Garrett Temple, a former LSU player, each scored 15 points for the Kings, who took the lead for good in the first minute of the second half. The Pelicans trailed by five points after Davis’ free throws with 4:13 to go, but Sacramento reserve George Hill, who had 14 points, responded with a 3 with 3:24 left. Koufos then converted inside to make it a 10-point game with 2:44 left and New Orleans never got closer than six after that. Kings: The victory was the first with assistant coach Elston Turner temporarily in charge because of head coach Dave Joerger’s recent absence. Joerger returned to Sacramento for a medical check-up after light-headedness caused him to leave a game at San Antonio on Sunday. Joerger has been deemed fit to return to coaching. … Randolph shot 11 of 23 overall and 3 of 6 from 3-point range. … Reserve G Buddy Hield, drafted sixth overall by New Orleans in 2016 and sent to Sacramento as part of the trade that brought Cousins to the Pelicans, scored eight points on 4-of-9 shooting, but missed all four of his 3-point attempts. … The Kings improved to 9-20 on the road, with two of those victories coming in New Orleans. Pelicans: Shot 9 of 25 (36 percent) from 3-point, including 3 of 15 in the second half. … Reserve F Cheik Diallo played for the first time since Jan. 10. He was in the game for six minutes and had two points and a rebound. … G Tony Allen was in uniform and active after missing 22 games with a fractured left fibula, but did not play. … F Dante Cunningham, who has started forward in both games since Cousins’ injury, left late in the first half with back spasms. … C Omer Asik played a season-high 24 minutes. He had four rebounds, a block, a steal and one point on 1-fo-4 free throw shooting. Gentry expressed frustration with the Pelicans’ repeated struggles in third quarters this season, which continued against Sacramento. Kings: Host Golden State on Friday night. Pelicans: Visit Oklahoma City on Friday night.